Formerly known as Cano-an. Erected a parish on 14 June 1836 with the advocacy of San Vicente Ferrer, and formerly named Canoan was once part of the Siquijor parish. Redondo (1886, 189) describes the church as made of tabique and having a nipa roof, the convento was likewise thatched with nipa and made of wood. The Recollects remained until 1898 and left behind a church and convento both of which burnt and have been replaced by modern constructions. 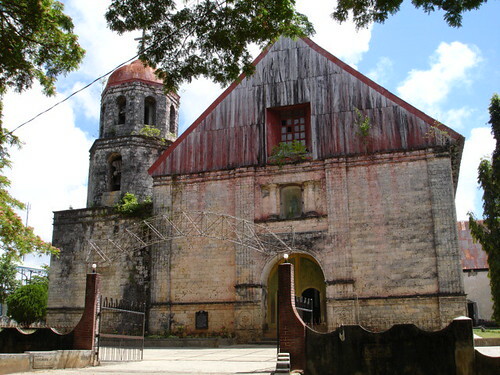 Erected a parish on 16 October 1880 with the advocacy of Nuestra Señora de Providencia, Maria (formerly Cangmeniac) was once part of the Siquijor parish. 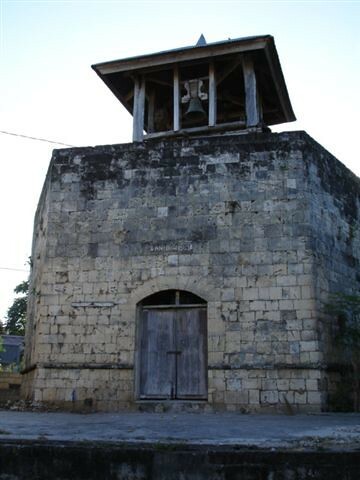 Redondo (1886, 192) describes the church as dilapidated and made of tabique with a nipa roof; the convento was even worse made of thatch and wood. The church complex was built by the Augustinian Recollects in the latter half of the 19th century. The church has two pulpits, the original retablos, and wood floors with herringbone pattern. The church walls are approximately a meter thick, The walls are reinforced with log post which are embedded in the wall. The façade is veneered with coral stone, while the rest is made of fill. The pediments of the church are made of wood panels. Formerly called Tigbawan, Lazi was made a parish, independent of Siquijor on 8 August 1857 with the advocacy of San Isidro Labrador. It had old church of stone and mortar, however, a new church was in the process of being completed and the convento was in poor condition because its wooden members had deteriorated, reports Redondo (1886, 192). By 1884, Lazi had a new church and in 1891 a new convento. 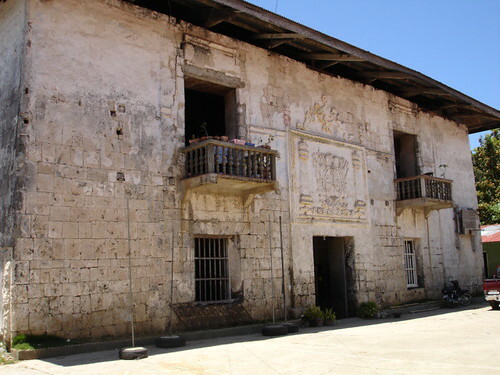 Both are attributed to Fray Toribio Sanchez who began working on the convento in 1887 using coral blocks and hardwood. Other constructions initiated by the Recollects were the casa real, escuela, bridges and irrigation system. Heritage site: Built at the initiative of the Recollect friars, the church belonged to the chaste neoclassical style. The convento has the distinction of being one of the largest built in colonial times. To raise funds for the convento, a public subscription was launched among the parishes and missions of the Recollects. A poster seeking for donations for the Lazi convento is kept in the archives of Xavier University’s Museo de Oro in Cagayan de Oro. 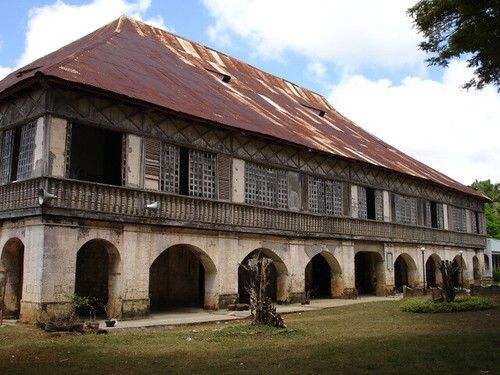 The unusual size of this convento, a oversized bahay na bato, with an arcaded first floor, was probably intended as a regional rest house or sanitarium for missionaries in the Visayas and Mindanao. Dedicated to St. Francis of Assisi, Siquijor was created a parish independent of Dumaguete in 1781 (other sources say 1780, but this is the year when approval was given). It was the lone parish in the island until other parishes were created out of it. 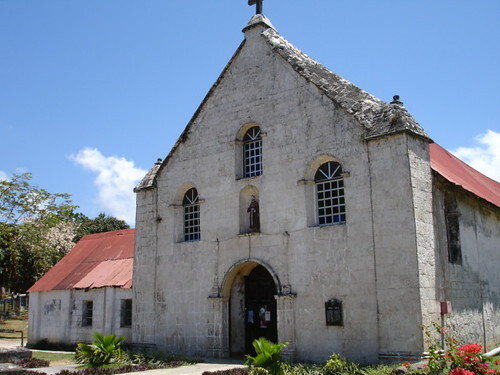 Its church (said to have been built in 1774) was made of stone, cruciform and had a nipa roof. It had generous proportions. Being 198 x 42 feet and 24 feet in height. The adjoining convento was likewise made of stone rubble. 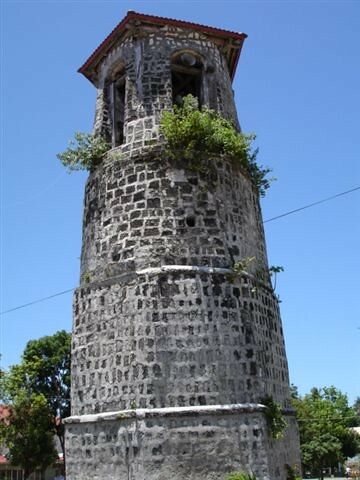 Heritage site: The bell tower of Siquijor stands independently of the church in the middle of the plaza. 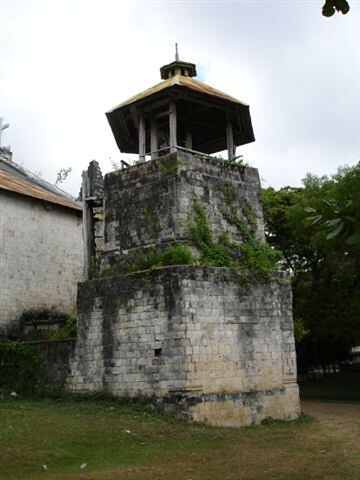 This arrangements suggests that the tower also served as a defensive structure—a watchtower to warn the people of approaching danger.